This the the Regional Hospital of the state of Kursk. Oblastnaya balnitsa, or Regional Hospital in English. It is the largest hospital of the state, and perhaps the most modern of them all. Inside its more modern operating theatres, dozens of surgeries are performed every moment. 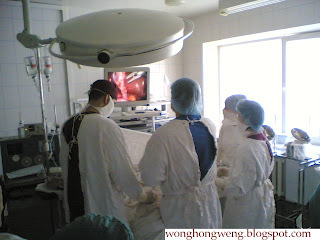 A procedure of laparoscopic cholecystectomy. There we were, observing our tutor as she assisted the head surgeon, who was meticulously dissecting the bilestone-filled gallbladder of an ill-stricken patient, with the help of the endoscopic video. It was smooth sailing all the way, until the dissected gallbladder slipped from the remote forceps into the abdominal cavity. "Uh oh!" we echoed in unison. "Oh, is that the way you express it in English? 'Uh oh'?" one of the surgeons asked. "In Russian we say 'Oi!'" We chuckled lightly while the head surgeon picked the stapled-shut piece of useless appendage from the abdominal cavity and extracted it out from the still unconscious patient. "There, all is fine. Come, follow me and I'll show you the precious gemstones." No matter how modern the operating theatres could be, there would always bound to be 1 or 2 Soviet-era pieces of equipment lying around. 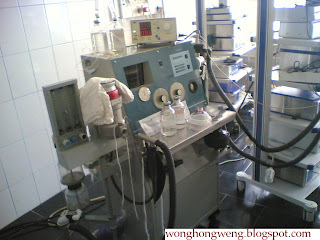 In this case, it was the ventilation machine. As long as it works and gets the job done. Sometimes the tools they use were so archaic, that the principle of that particular technology was unheard of in Malaysia. But they're happy as long as its still working. As the operation completed successfully, we moved back to our classroom. 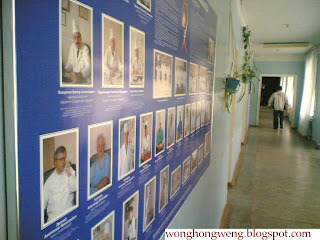 Hall of Fame: portraits of great Russian surgeons filled the walls of the hallway. We continue the lesson with more practice of objective examination and diagnostic skills. 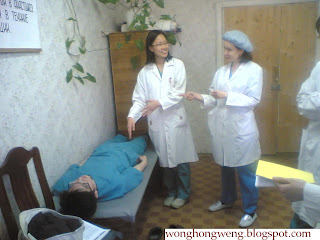 A mock patient, a student and our tutor. For the Russians, skill is as important as knowledge itself, maybe more. As compared to the western world which is overly dependent on modern examination instruments, the Russians use their healing hands more often. "A great physician uses not only his mind, but also his skillful hands. In times of war and difficulty, there would either be not enough instruments or simply no electricity for your MRI machines," a well-respected professor once told us. 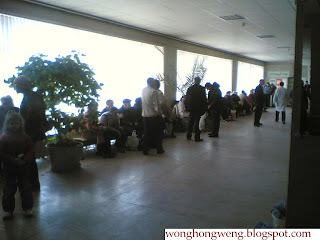 Patients waiting for their chance at the healing hands. And so that was class at the Regional Hospital, all in a day's work. haha..u took the photos with ur handphone or camera?